At a time when the world seems more disconnected -- ironic, considering how much more connected to each other our technology strives to make us -- there's growing popularity in family-owned properties; places that offer more attention to the needs of individuals or groups, and make a rare connection to travelers that stand out and remain memorable long after a guest's stay. Summer waved goodbye more than a month ago, but the fall season still remains one of of the best times for travel. Recent stats note that New York City, Orlando and magical Maui are the top three destinations for travelers near and far. However at a time when the world seems more disconnected -- ironic, considering how much more connected to each other our technology strives to make us -- there's growing popularity in family-owned properties; places that offer more attention to the needs of individuals or groups, and make a rare connection to travelers that stand out and remain memorable long after a guest's stay. Take note of five family-owned properties worthy of a check-in this season. Owner and founder Gerald Fischer can remember pounding in the first nail into the plywood of what would become the reliable and conveniently located Yosemite View Lodge many decades ago. At that time, Fischer's family purchased an existing building and the land on which it sat -- it was perched along the powerful Merced River in El Portal. But there was room to grow. And grow the Fischer Family did -- along with this property, the clan also owns, operates and manages Yosemite Cedar Lodge and Yosemite Vacation Resorts. (Stellar cabins there, by the way!) With more than 300 rooms and suites now at Yosemite View Lodge, the property remains insanely popular and well-occupied, and all just a mile from the gates of Yosemite National Park. The Fischer's honed their concept well -- comfort and space make for a winning combination here -- and there's a clear sense that they also gave considerable thought to how each of their rooms ought to be designed -- space for the entire family and/or couples and friends. With that in mind, the rooms here vary from remarkably spacious suites to one and two bedrooms and all of them support the guests' needs -- having a spot to "land" after a long day at Yosemite, accommodations for such things as food preparation and other opportunities along the property to take advantage of down days--time to lounge around the pool (there are several here) or experiencing the historic restaurant and (good for the kids) a massive game room. There's a saying that circulates whenever people talk about what it takes to have a successful business that offers something unique to customers -- that "things flow down from the top." Using that formula, it would appear that somewhere in the higher echelons of this family, the Fischers have managed to capture the needs of "family" so well here, because they, themselves, are a large family, with many generations still gathering together for family functions near and far. In that respect, it's refreshing to come across one of the area's more memorable stays in a region that is downright breathtaking. 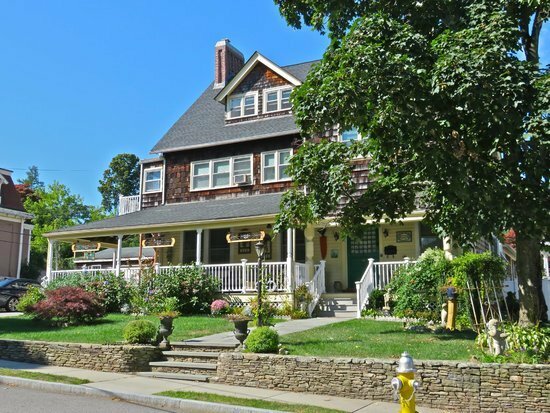 A New England Bed and Breakfast with a surprise waiting for you in the kitchen? And a surprise that has nothing to do with food? Well, not really fresh food. Okay, we'll bite. But first, let's start with the three major plusses: cleanliness, its friendly hosts Romana and Charles Zawarti, and the location. It's Newport, people. What's not to like? Being perfectly perched in one of the country's premier ports is ideal, but here's the magnum opus of this B&B: Carrots. Yes, you heard that right. Carrots. As in ... the largest collection of carrot figurines, according to reputable agencies. Consider it the nation's preeminent carrot museum. You can find more than 2,000 orange-colored marvels here -- carrot cars, toothbrushes, stampers, chocolates, dog toys, clocks, neck ties -- oh my! -- salt 'n pepper shakers, napkin rings -- stay with me here -- pens, bowls, light switches and, well, so much more. Romana, whose roots stem back to Poland, considers herself a purist, began collecting these figurines more than 15 years ago -- she will not collect anything other than carrots, she will assure you. Best of all, the woman's self-awareness about it all -- she takes it all in good (but serious) fun; these are carrots, after all, add some wonderful levity to the stay here. Added perk: If you happen to be around during the holidays, the Christmas tree in this place is downright transcendent. Hawaiian native and WWII war vet Richard Kimi gave birth to this property back in 1956, with the hopes of harnessing the Aloha spirit (love) and offering a portal with memorable hospitality. More than 50 years later, Kimi's original intentions still shine through in this conveniently located establishment. 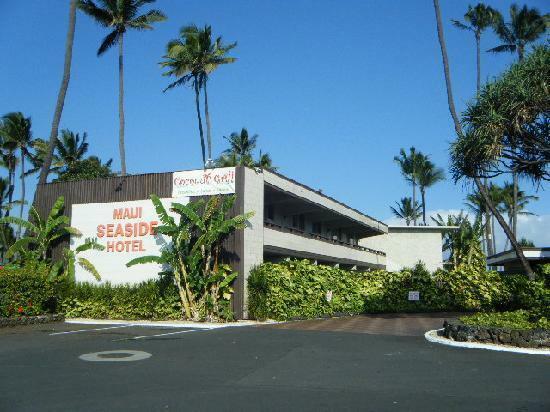 He would create a hotel chain actually -- other places with the "Seaside" brand exist on The Big Island. The properties -- still run by the same family -- now boast more about a thousand rooms. Three things that stand out here, beyond the location: 1) Suites, which are located in their own building and perfect for longer visits. 2) Beach access, although the trade winds here can be a bit moody -- still, you've got the whole island of Maui to explore, too. 3) Cleanliness and quiet -- a tie. Sometimes it's challenging to locate an ideal location that feels "clean" but when the place also feels tranquil, it's a definite treat. Like the folks who have infused a sense of family and community into Yosemite Resorts, Hofsas House owner and manager, Carrie Theis, fondly recalls working at her family's striking Bavarian Inn-inspired Carmel property when she was a young girl. It was back in the 1960s and 1970s that she learned from her mother and grandmother just what it took to own, operate and sustain a successful hospitality business -- integrity chased back with a genuine interest in people and the journeys they happen to be on. Several decades later, Theis continues in the same vein as her grandmother and, with the assistance of an experienced staff, manages to keep the 38-room Hofsas House running successfully. It doesn't hurt that the property rests just a block from Downtown Carmel, one of the more magical spots along California's Central Coast. And like the seaside town in which it dwells -- a town that itself boasts the charm of a European village -- Hofsas exudes a kind of other-worldly vibe, This is one of those rare places in America where you actually feel as if you might be in Europe. Spacious rooms -- many with their own motifs -- are all decorated with down-home nuances -- from vintage bedspreads and pillows to fireplaces, kitchenettes and antiques which, during grandma's era, may not have been antiques at all. All of these add to the winning qualities of this family-operated property. You feel as if you've gone back in time a bit -- or, even into the old room that you used to crash in at one of your relative's home when you were a kid. Carmel is hosts to many Inns and bungalows, and each one has their own mystique, but Hofsas stands out for its customer service relations and ability to keep an older property fresh, thriving and relevant in a media-frenzied era that so desperately keeps searching for the Next Big Thing. Sometimes that Next Big Thing is something that ripens beautifully with age. Like Hofsas. Cheers to that. How can you resist a Midwestern Inn located in a historic lumber town that was also (and still is) home to another piece of history: The Mabel Tainter Center for the Arts (originally named The Mabel Tainter Memorial Building -- that's another story in and of itself. Let's begin with introductions; Meet Maggie Foote, the innkeeper here. The wonderful combination of Foote's own history and Oaklawn's history makes for an interesting pairing. Dipping back even further, to 1989, the property was known as the Oaklawn Stock Farm, a 518-acre farm that had something modern and rare at the time -- indoor plumbing, closets, hot water, heat and electricity, which legend has it, was used to "avoid the constant fear of the dangerous lantern." A water tower was also on hand to offer water to all of the farm buildings on the property -- eight other structures plus three residences, not to mention a racetrack and more. At the time, Andrew Tainter owned the property -- Tainter was well known in the area; a partner in the Knapp, Stout & Co. Lumber Company. Over time, the farm became nationally known for its "high-bred trotting stock" and boarding services. 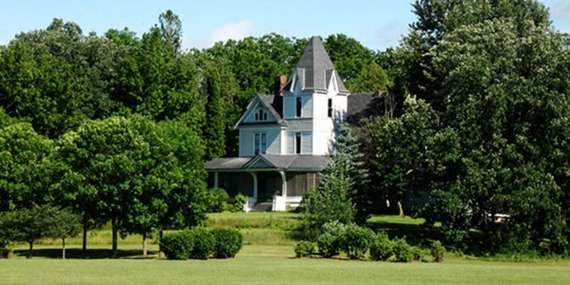 The farm remained in Tainter's family through 1948, until it was purchased by the John P. Dale family who maintained it until 1968. The Dale families all lived at Oaklawn until 1990. At that point, construction began for the Stout Technology Park. Enter Foote. She had known about Menomonie for some time, having grown up in nearby Poplar, Wisconsin. Menomonie, for those who may not be familiar with the area, is now a prominent University town which rests about an hour west of Minneapolis, Minnesota. A 1974 graduate of UW-Stout, Maggie came back to Menomonie in 1985 and became executive director of the Mabel Tainter Memorial. It was during that time that she was introduced to Oaklawn Stockfarm. She also did fine work as executive director of a 1926 historic theatre and performing arts center for the State Regional Arts Center in nearby Eau Claire. Foote notes how she and Oaklawn became partners: A fortune cookie. She picked one up one day and the note inside read: "be careful what you wish for." Shortly thereafter, she and her then-partner Les, purchased Oaklawn and began reviving the grand old Victorian farmhouse. Today, Oaklawn remains a historic gem and Foote breathes wonderful life into this remarkable setting -- clearly, she has taken a cue from all the things she learned spending time with her great grandparents during her youth -- namely, the importance of family and connection.